folate rich Indian recipes. Sometimes, when you complain of fatigue, skin problems or palpitations, the doctor prescribes folic acid tablets. When women are pregnant too, they are prescribed to take folic acid. What is this nutrient, and why is it important for you? 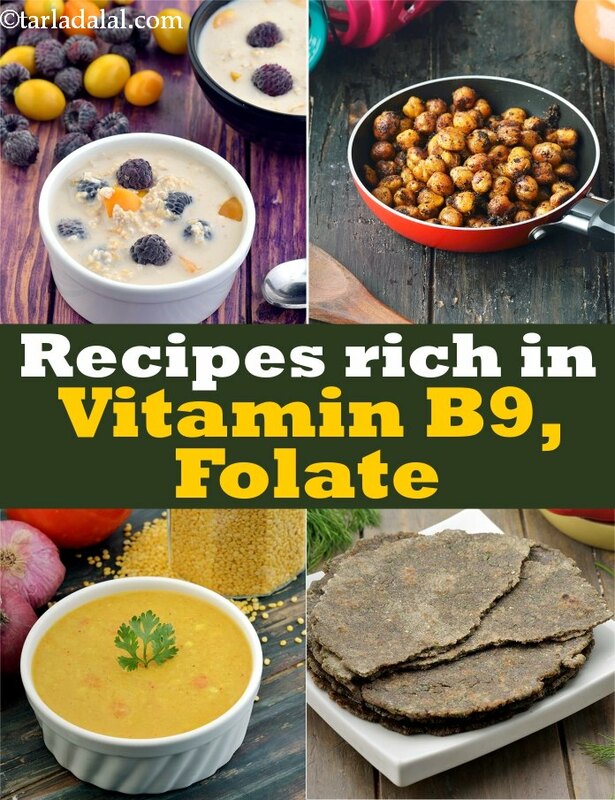 Folate or Vitamin B9 helps your body to produce and maintain new cells, especially red blood cells. It also helps prevents DNA changes that might cause cancer. Adults and grown-up kids need 100 mcg of this vitamin every day. Its deficiency is known to cause megaloblastic anaemia in both adults and children. This is accompanied by symptoms like fatigue, palpitations, change in skin colour and shortness of breath. It is particularly important for pregnant women to have enough folate. They must start having folate rich foods even while they are planning to conceive. Consuming enough folate before and during pregnancy helps to prevent major birth defects concerning the baby's brain. Along with foods rich in folate, you should take a folic acid tablet (synthetic form of folate) every day while you are trying to get pregnant and until you are 12 weeks pregnant. We have a good collection of folate rich Indian recipes. There are several good sources of folate, which you can include in your daily diet to prevent its deficiency. All these wonderful ingredients can be cooked into tasty dishes that the whole family will enjoy. Here are some of the popular folate-rich ingredients and our favourite recipes using these. Looks like you are going to have a delicious time upping your folate intake! What fun! Enjoy our folate rich Indian recipes and other Vitamin recipe articles below. An indispensable part of many western dishes, this low calorie version of tomato gravy tastes great and is also rich in the anti-aging nutrient, vitamins A. Use this in recipes like, Indian Sizzler and Cabbage Rolls in Tomato Gravy. Tomato shorba is a tangy soup made from tomatoes and coconut milk, mildly spiced with cumin seeds and green chillies. The addition of jaggery imparts a slight sweetness and reduces the sourness of tomatoes, making the soup all the more pleasing to the palate.